First Sergeant Almony, in January 1972, attended Basic Training at Marine Corps Recruit Depot, Parris Island, South Carolina. Following Basic Training, he reported to Marine Corps Base, Camp Lejeune, North Carolina for Infantry Training. Upon completion he reported to Engineer Support Company, 2nd Engineer Battalion, 2nd Marine Division, Camp Lejeune, for duty as a Heavy Equipment Operator (1345). In June 1973, he was temporarily assigned to Headquarters Service Company, Battalion Landing Team 2/6 and deployed for a six month Mediterranean deployment aboard the USS Fort Snelling (LSD-30). After his return, he transferred to Engineer Maintenance Company, Maintenance Battalion, 3rd Force Service Regiment, FMFPac, during July 1974. During his tour of duty in Okinawa, Japan, he attended the Career Planning School at Camp Hansen, and later reenlisted for a lateral move to Marine Aviation. In September 1975, he was transferred to Marine Aviation Training Support Squadron-901, Naval Air Station, Memphis, Tennessee, for temporary instruction at the Aviation Structural Mechanic-E School. Upon completion he transferred to MCAS Cherry Point, NC. He attended AV-8A Harrier Egress and Environmental specific training. While at Cherry Point, he served with Headquarters and Maintenance Squadron-32 and VMA-231, Marine Aircraft Group-32, until his discharge from active duty in October 1979. After his return to Pennsylvania, he enlisted into the United States Marines Corps Reserve, and joined VMA-131, MAG-42, 4th MAW for duty as the NCOIC of the A-4 Safety Equipment Mechanic Workcenter. After completing training at the Quaker City School of Aeronautics, he returned to active duty and transferred to VMA-542 during September 1981. During August 1982 he attended Staff Non-Commissioned Officers Academy, Quantico, Va. 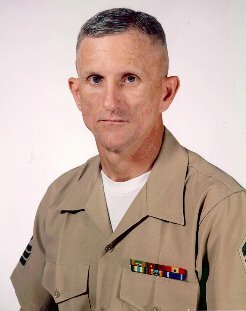 In March 1988, he transferred to NAS Memphis, for duty as an Instructor, Senior Marine, Assistant Course Supervisor, and Senior Troophandler. Returning to Cherry Point in 1991, he reported to VMA-223, where he served in various squadron billets. During August 1993 he attended the Staff NCO Advance Resident Course at Camp Lejeune, N.C. In May 1994 he was promoted to his present rank of First Sergeant and was transferred to 1st Unmanned Aerial Vehicle Company, 1st SRIG, I MEF, 29 Palms, CA, which was later redesignated as VMU-1, MAG-13. During June 1996, he deployed with the squadron to Bosnia-Herzgovina in support of Operation Task Force Eagle and Operation Joint Endeavor. Returning to the United States in September 1996, he was transferred to his present unit. First Sergeant Almony's decorations include the Navy and Marine Corps Achievement Medal, with two Gold Stars in lieu of 3rd Award, Good Conduct Medal, with one silver and one bronze star in lieu of 7th award, National Defense Service Medal, with one bronze star in lieu of second award, Armed Forces Service Medal, Sea Service Deployment Ribbon, with three bronze stars in lieu of fourth award, and the NATO Medal. First Sergeant Joseph M. Almony Jr. presently serves as the First Sergeant, Aviation Maintenance Squadron One, Marine Aviation Training Support Group, Pensacola, Florida. He assumed his current assignment on October 1, 1996.